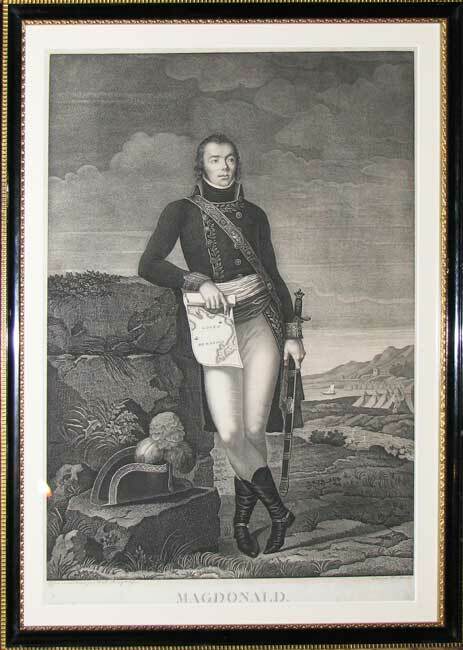 Jacques MacDonald (1765-1840) was a leading marshal of post-revolutionary France and a highly regarded military strategist under Napoleon during the Napoleonic Wars. He is remembered as a military genius and was given a great deal of autonomy by Napoleon. In the 1790s he occupied Rome for the French and went on to capture the Kingdom of Naples. In recognition of this Napoleon created him Viceroy of the Kingdom of Italy in 1809. He went on to lead the French army from Italy and join forces with Napoleon's troops at Wagram where they defeated the Austrians. He was subsequently appointed Duke of Taranto in the Kingdom of Naples and it is this accolade that is celebrated in this magnificent portrait. His career continued with distinguished service in Spain, Germany and Russia and his military record reveals him to be a man of unblemished character. He owes his Scottish surname and revolutionary zeal to his father Neil MacDonald a Jacobite rebel rouser from South Uist in the Western Isles of Scotland.